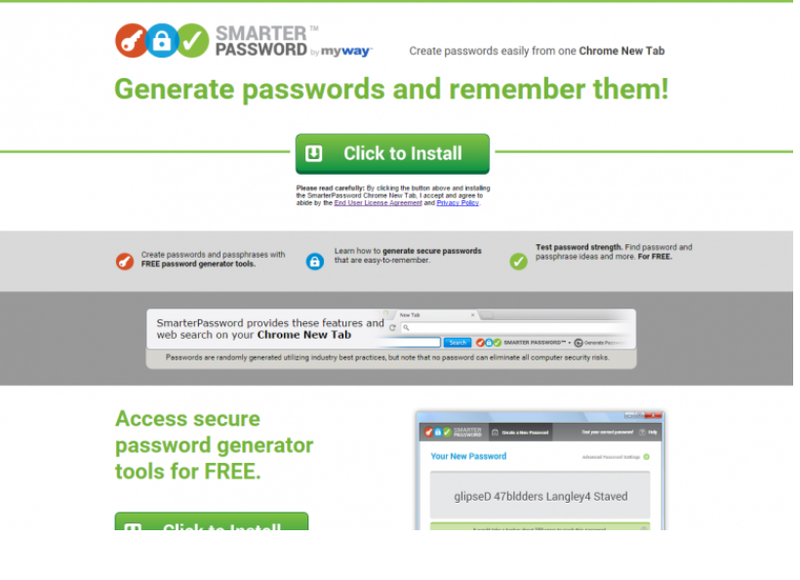 Smarter Password is an application that should help users to generate safer passwords and remember them easily. Even though this program seems to be very beneficial, you should know that this program is closely associated with all kinds of commercial advertisements that are visible on your screen. Yes, Smarter Password is known to be an ad-supported program. Even though this program seems to be really beneficial, we still do not think that it is a good idea to keep it installed because it might really expose users to threats. Unfortunately, it might be rather difficult to remove Smarter Password from the system and thus stop those ads from appearing. Therefore, we are going to help you with that. All you need to do for now is to read through this article. How does Smarter Password act? Smarter Password might really help you to create a strong password; however, this program is definitely not a useful one, so you should not keep it installed on the system and use it. The main reason why Smarter Password cannot be considered a trustworthy program is the fact that it is going to show all kinds of ads (banners, pop-ups, in-text ads, interstitial ads, etc.) on a user’s screen. These ads might look quite decent; however, the truth is that they might redirect to bad web pages very quickly. Of course, not all the ads are harmful; however, it is impossible to say which of them are good. There is also another reason why you need to uninstall Smarter Password from your system. According to our specialists, you might experience privacy-related problems if you decide to keep this ad-supported program on your system. We do not think that you want this to happen. How did Smarter Password manage to enter my computer? There are several ways how adware programs are distributed. First of all, you might have downloaded and installed Smarter Password yourself because it has its official website. Secondly, it is known to be capable of attaching to different programs and thus entering systems together with them. Unfortunately, the majority of untrustworthy programs use the bundling method to sneak onto computers. Therefore, it is very important to take care of the system’s safety. All you need to do is to install a security tool and keep it enabled on your system. We suggest that you surf the web very attentively in the future too in order not to encounter threats similar to Smarter Password. How to delete Smarter Password? It is very important to remove Smarter Password as soon as possible if you do not want to cause harm to your system. You can do that either manually or automatically. It is not a difficult task to delete Smarter Password in a manual way because this program can be removed via Control Panel; however, we suggest less experienced users to go for the automatic Smarter Password removal. If you want to implement the Smarter Password removal with an automatic tool, you need to acquire it first. Then, scan your system with it.